Meet Tori White- class of 2014 Senior Couture Ambassador (SCA) representing Wakeland High School. Tori started off her mini-photo shoot at Michael Greene's makeup studio. Michael first approach for her classic look was to enhance her natural coloring. He brought her eyes out with amazing precision and at the same time taught Tori how to apply her makeup just like him. Michael encourages all of our SCA's that they, too, can create the same look on their own. After her makeup application, Tori, along with her parents and brother, followed my staff to the first location which was right on the loading dock of the building that Michael's studio resides. Tori is an amazing and multi-talented young lady. She's very active in her school's marching band playing the flute, is active in her church, and like every young teenager loves to shop at places like Charlotte Russe, Victoria Secret, Forever 21, and Love Culture. It was great working with Tori because she just exudes confidence and really shows her personality easily in front of the camera. Dressed in a beautiful purple dress, Tori had the opportunity to use one of our new antique props. The neutral colored background made her gorgeous dress stand out. Tori's teal colored dress really complimented her fun, trendy look. She hardly broke out in a sweat even though it was super hot outside. The breeze helped all of us cool off a little. We had a fun time asking Tori about her experiences in marching band and even got her to relax after a good laugh. This photo really brings out her fun personality. Tori relaxing on the edge of a loading dock and taking in the cool breeze. She really had a great time and AfallaStudios would like to wish her a memorable senior year at Wakeland High School in Frisco, TX. 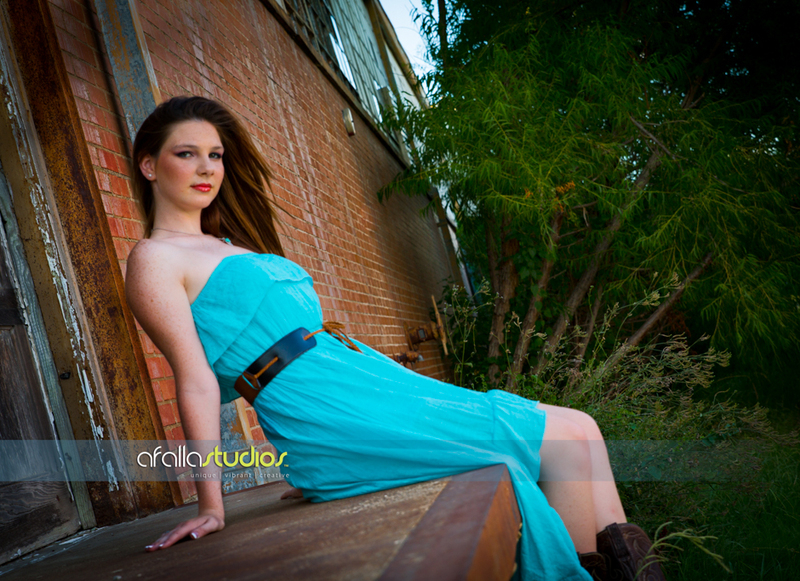 If you're a Class of 2014 senior attending Wakeland HS and would like to take some amazing senior portraits, contact AfallaStudios for more information on our session prices. Also, be on the look out for Tori when you see her at school and request for her SCA card. Congratulations to Tori on a successful mini-photo shoot! And remember, every girl is beautiful both inside and out.